The Dutch team outplayed the Norwegians when they invited to a training match in mid-January. The teams played a big team game with 3 pairs each. Table 1 serves as an anchor, both the other two tables score their lists against table 1 so each round ends up in a double scored team match. The Dutch was NS at table 1 and EW at table 2 and 3, Norwegians vice versa. The Dutch was both lucky and strong during the match, the final score was about 250 imps ahead of the Norwegians. If they play like this in the coming Bermuda Bowl there wont be many teams able to challenge them for the title. Let’s look at a hand from the match. I’m not sure if you agree on the bidding when you have decided to double the final contract of 6spades. Anyhow you have to find the killing lead. What’s your choice? I hope you gave it an extra second to analyze the bidding. 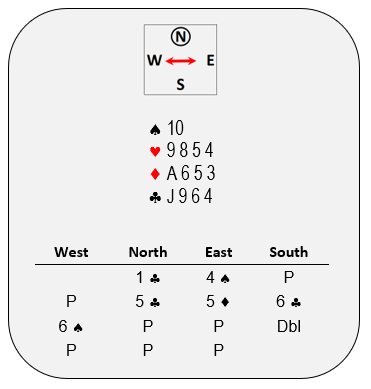 West are red against white and push hard by bidding 4spades then 5 diamonds. It is likely to expect west to hold at least 11 cards in those suits, maybe more. 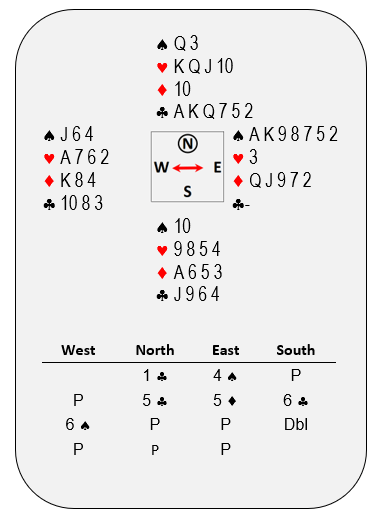 Next you find east to pass 4 spades then compete to 6 spades after west rebid diamonds and NS compete till 6clubs. How come he showed up with such values? Maybe east are looking at fit in both suits. This was the analyze the Dutch champion did as south. He led the ACE OF DIAMONDS! South gave north a ruff playing a second diamond, the rest of the tricks came easy for declarer for 1 down. The Norwegians at the other tables took different views when north bid 7 clubs directly for – 300. The last table was a Norwegian disaster when they doubled 4 spades making 1160. The hand gained the Dutch team 27 imps. On another lead 6spades would make for 1660 and 27 imp to Norway.